At the 2012 American Peony Society Board Meeting, Peony 'Topeka Garnet' was selected to receive the 2012 American Peony Society Gold Medal. This is a very prestigious award, and only one peony is selected each year to receive this award. Also, in the past few years, the APS Gold Medal award winner must also have been honored with the ALM (Award of Landscape Merit) in order to be considered for the APS Gold Medal. So that means that this peony should be a great garden subject with sturdy stems and good foliage. Peony 'Topeka Garnet' was hybridized by Bigger and registered in 1975. Here is what the APS registration says "TOPEKA GARNET (Bigger) (14-59) 1975. Dark red single. 30" stems. Small tuft of stamens. Flower fades some. Registered Myron D. Bigger. Bulletin #214 June 1975." I don't currently have this peony, but luckily I somehow already placed an order for this peony earlier in the year. If you don't already own this one, you may want to get your order in quickly for shipment this fall. I'm sure these will be selling out fast this year and next year! 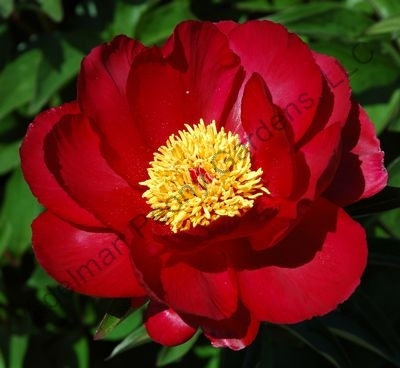 Adelman Peony Gardens is one vendor who is selling Peony 'Topeka Garnet' this year. (That's where I ordered mine from). :) Good luck!